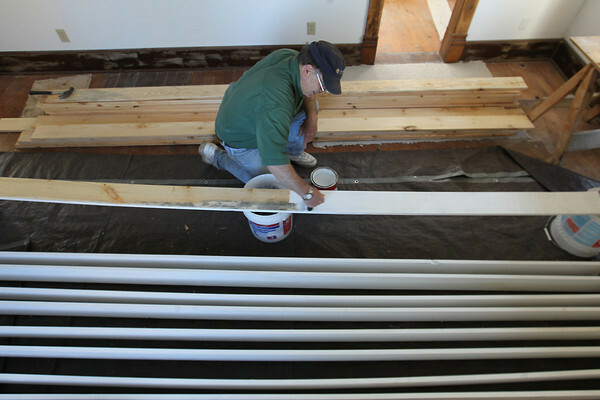 Volunteer George Quarderer (cq) paints baseboards for the upstairs of the Thoreson Farmhouse Tuesday in the Sleeping Bear Dunes National Lakeshore near Glen Arbor. The farm, which dates to the late 1800s with the Thoreson family, has been undergoing renovations from National Park Service volunteers and volunteers from the Glen Arbor Art Association, which is restoring some of the farm's buildings for arts education. The author Richard Bach also stayed in the farmhouse in the 1970s, where he wrote the best-selling novel, "Jonathan Livingston Seagull."